A Kentucky father is heartbroken and in "disbelief" after his 13-year-old daughter mysteriously died hours after getting sick at her cheer competition. Eighth-grader Lilliana Schalck was warming up at the All-Star competition on Feb. 23 when her hands went numb and feet started tingling, said her father, Dan Schalck. Very quickly in the ER things just kind of degraded. "I kind of took her aside, was maybe going to get her some fluids," Schalck told ABC News Wednesday. "She was just getting kind of weaker, just not acting herself. She just wanted to sit on the floor." The team couldn't perform without her so they took themselves out of the lineup, he said. "The medical staff at the venue came over, asked some questions, tried to get an assessment," he said, and they decided to bring Lilliana to the emergency room at a children's hospital in Columbus. 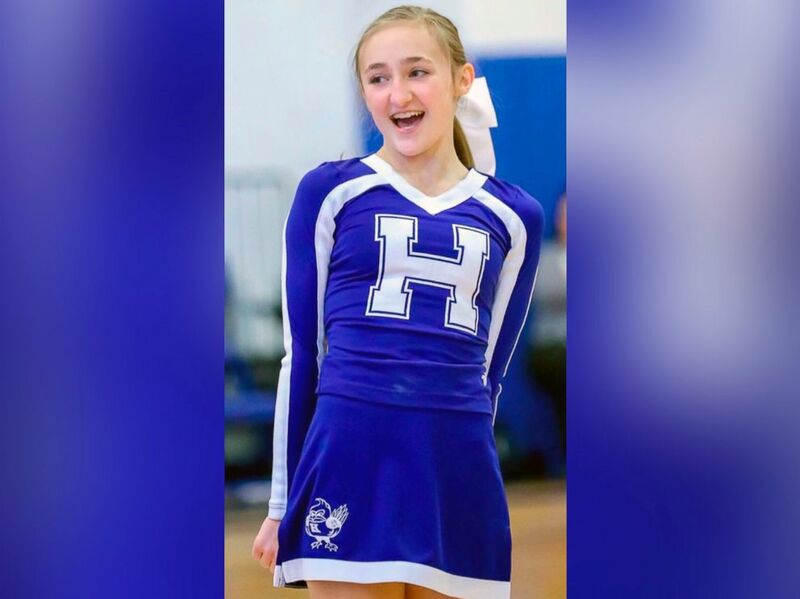 Lilliana Schalck, 13, died suddenly on Feb. 23, 2019. "Very quickly in the ER things just kind of degraded," Schalck. "The nurse liaison pulled me aside and asked me who would be important in her life that I might like to call." Lilliana's heart stopped multiple times, he said. I was in disbelief. I couldn't understand what had happened so quickly. "In the ICU they were working on her. At some point I was able to get close, hold her hand. At that point they just couldn't do anymore," he said. Lilliana's team was supposed to compete at 6 p.m. and he said the team took themselves out of the competition around 5:45 p.m.
"At 7:40 [p.m.] they pronounced her dead," he said. Schalck still does not know how his daughter died. "One nurse came out and said, 'We have no idea. We're grasping,'" he said. "I was in disbelief. I couldn't understand what had happened so quickly." Nationwide Children’s Hospital declined to release any information on the death, deferring comment to the coroner's office. Dr. Anahi Ortiz of the Franklin County Coroner's Office said there are no preliminary findings from Lilliana's autopsy. "We have pending for cause and manner at this time," Ortiz told ABC News in an email Thursday. The full coroner's report is expected to take eight to 10 weeks. She was really good at it -- which made her work hard to be even better. Lilliana is also survived by her mother and sister. Schalck described his daughter as kind, sincere, hardworking, loving and outgoing. "She was a happy kid," he said. "She loved her school." He said he's grateful for "the outpouring of support from the whole community." "When she cheers for the All Star, they get kids from pretty much anywhere in the area. So she knows kids at every school in our area," he said. "We've had an outpouring [from] every school, every community." Besides the All-Star team, Lilliana was also a member of her high school's cheer team, dad said. Lilliana was a flyer, meaning she's tossed into the air by her teammates. "She was really good at it — which made her work hard to be even better," her father said. "You have to have a certain mentality to be able to cope with that kind of pressure. But she relished it." She was even looking to cheer in college. "You can always dream," he said. Lilliana was "beloved by so many and we know our students will need help through the grieving process," Karen Cheser, Superintendent of Fort Thomas Independent Schools, said in a statement Sunday. "School counselors will be available this week at school for any students needing to talk with someone."